Renowned three-Michelin star chef participated in the season 4 of World On A Plate event which was recently held in Mumbai. In a conversation with the attendees, he shared his journey, inspiration and more. 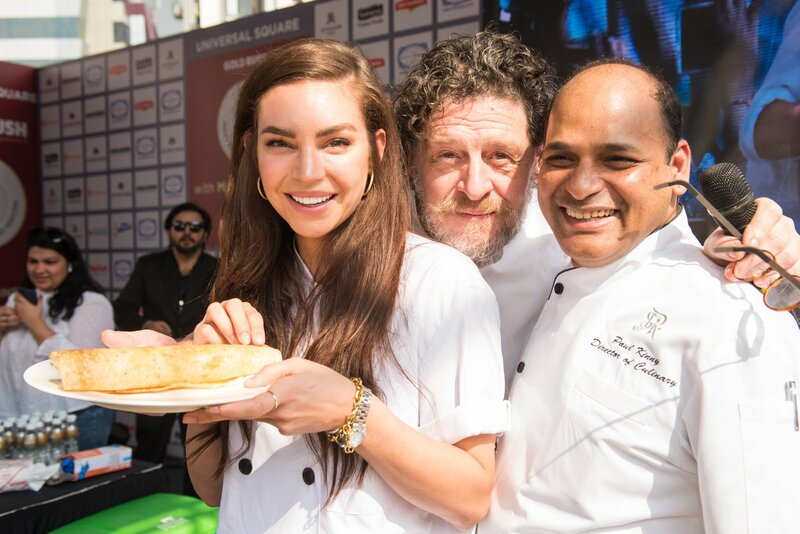 After celebrating three successful seasons of World On A Plate, this year’s edition in Mumbai brought a lot of joy to the cooking enthusiasts as the godfather of “Modern Cooking”, Chef Marco Pierre White inaugurated the fourth edition of the event held at The St. Regis. This season saw national and international culinary chefs and connoisseurs, like Chef Sarah Todd, Chef Ranveer Brar, Chef Jason James Hudanish, Chef Ajay Chopra and others engaging and interacting with the participants, thereby motivating them. Boasted as India’s premier and biggest gourmet festival, this season of World On A Plate saw students of Deeds Foundation with hearing disabilities use sign language to sing the national anthem. Chef Marco then unveiled the event traditionally after which he showed his expertise in Indian cuisine by making a Dosa along with Chef Sarah Todd. On the same occasion, Mr. Kiran Soans, CEO of Gold Rush Entertainment pledged his support to HUG foundation for underprivileged children and requested the audience to do their bit in this very initiative. While having a conversation and interaction during his masterclass, Chef Marco, shared his journey of winning three-Michelin stars. He said, "The three-Michelin stars were the discovery to who I was as a person. One needs to understand why you love anything so much. If you want to make your dream come true, but detach yourself from the emotions. It is important to have the confidence to get to a moment in life and serve something you want to serve. It is important to learn and master the art of cooking, and this, one day brings the opportunity where you'll feel the urge show it off." Sharing his dream and secret to motivation, Chef Marco, said, "I was ruled by my insecurities when I was young but that's what drove me. My biggest fear was always the fear of failure. My father never acknowledged me earlier, but that taught me to get up and push me for sure. One should realize their dream and should accept it. It was never about being a star and making money. I always learned to put my skills to the best use, which has brought me here today. It is essential for one to learn to Keep their head down, keep pushing, thereby learn the craft without counting hours by being brutally honest and questioning everything they do." He also shared his experience of enjoying Mumbai. On being asked about the same by a member at the masterclass, he said, "People in Mumbai are like Italians, in terms of expression, emotions, and kindness. Being here is like a travel back home. Talking about the food, everything I have eaten or tasted here in India has been delicious and full of flavour. People here know to feed others. I'm a very visual person and I have had an emotional journey in the city. There is a constant smell of sweet spice and I have never had a journey which is so emotional and gastronomical. The people of Mumbai both like to cook and eat!" Adding to the experience of participating and tasting the dishes served at the event, he said, "I think it is good that a revolution started here a few years ago. In my visit here, I was expecting to get a varied list of curries, but I was surprised that there were influences from other countries. What impressed me more was the understanding of spice and texture, which works. Keeping this mind, I believe that Indian cuisine is one of the greatest and more preferred cuisines in the world. It has a sophistication, where people are exploring and refining it by making the cuisine strong and hybrid." World On A Plate Season 4 as promised proved to be a culinary extravaganza where chefs shared their love through exclusive master classes and their signature dishes. It was truly enriching and a learning experience for every food lover!